Disasters are getting worse. How much are we to blame? Scientists began searching for human fingerprints on natural disasters in 2003. Our understanding is improving but is still limited. 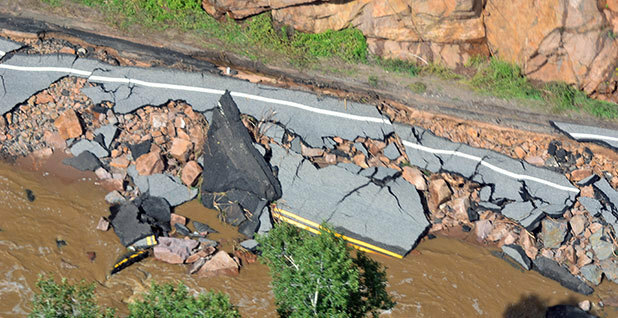 Seen here is damage from record rains over Colorado in 2013. Photo by Army Sgt. Jonathan C. Thibault, courtesy of Flickr. A cyclonic circulation swirled over Boulder, Colo., in September 2013 and drew a river of moisture from the Pacific Ocean off Mexico's coast. It dumped rain on the people below for five days. In that month alone, Boulder received more than half the precipitation it gets in an entire year. Saturated soils refused the water. It fell down mountainsides and roared through towns. Searching for an appropriate superlative, the National Weather Service called the storm "biblical." The Colorado floods followed Superstorm Sandy, which had drowned the Northeast coast the previous year and cost the nation $75 billion in damage. Was this the new normal, people asked -- and what was the risk of such storms returning? That question underpins attribution science, a relatively new field of research practiced by a small group of scientists. Their findings are meant to help people in positions of power -- politicians, humanitarian workers, water managers, hospital administrators -- make decisions about adapting to a changing world. There were 10 extreme weather events in 2015 that cost more than $1 billion each in the United States. They killed 155 people. The death toll is grimmer globally. Roughly 850,000 people died worldwide between 1980 and 2014 in tropical storms, floods, heat waves, droughts and other catastrophes, according to Munich Re Group. Most deaths have been in Asia. Most monetary losses have been in North America. The toll gives the scientists' communiqués political power. President Obama has used freak weather to help convince people that climate change is here, now, to the consternation of Republicans. Rep. Lamar Smith (R-Texas), chairman of the House Science, Space and Technology Committee and a self-proclaimed climate skeptic, criticized the attempt in February. "Statements by President Obama and others that attempt to link extreme weather events to climate change are unfounded," Smith said. So, who is correct? It depends. On the one hand, we live in a changing world, and all extreme events are caused by both climate change and nature. On the other, scientists cannot find a human fingerprint in many extreme weather events with great confidence using the techniques they have at hand. At most, they can tie heat waves and cold spells to climate change. They understand less about droughts and heavy rainfall, and very little about hurricanes, tropical storms, wildfires, extreme snow and hailstorms, according to the National Academies of Sciences, Engineering and Medicine. That has led at least one outspoken scientist to question whether traditional attribution downplays the impact people have on the climate. Now the scientific community is faced with a new question: asking not whether humans affect extreme weather events, but assuming they do and instead questioning the extent of their impact. Is Earth smoking a cigarette? Attribution science was born out of a flood. In 2003, Myles Allen, a climate scientist at the University of Oxford, watched the River Thames rise to within 30 centimeters (nearly 12 inches) of his kitchen door, he wrote in a commentary in Nature. On the radio, a meteorologist told listeners that scientists could not say definitively that the flood was caused by climate change, but similar events might occur more often. That wasn't good enough for Allen. People who stand to lose their homes want clearer answers, he wrote. Oxford University professor Myles Allen pioneered attribution science. Photo courtesy of the University of Oxford. 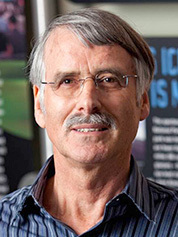 Since then, Allen and his colleagues have been at the forefront of efforts to say whether particular extreme weather events have become more likely due to climate change. It's a difficult task because all storms are caused by a unique set of atmospheric and oceanic drivers, and the probability of those drivers repeating in the same way is zero. As Heraclitus of Ephesus said, "you cannot step into the same river twice, for other waters are continually flowing in." Allen proposed a workaround. Rather than assign blame to humans for particular extremes, scientists could study a class of events, such as heavy rainfall in a certain geography, and say whether past human actions have increased their risk. "It is similar to looking at, how did cigarette smoking increase the likelihood of death or the risk of cancer?" said Heidi Cullen, a scientist with the nonprofit Climate Central. The following year, in 2004, Allen and Peter Stott, head of the U.K. Met Office, released the first climate change attribution study. The previous summer had set heat records in Europe. More than 80,000 people had died across 12 nations. On Aug. 10, 2003, meteorologists in the United Kingdom watching their CRT computer screens saw the temperatures crawl past the previous record of 100 degrees Fahrenheit. It was set in 1990. Allen and Stott found that human actions had doubled the risk of such heat waves. Human actions, they said, had created 75 percent of the increased risk. "After that 2004 European heat wave paper, the floodgates really opened, and more scientists were interested in looking at individual events," Cullen said. Allen and Stott had analyzed the simplest part of global warming -- a heat wave. The findings might have been a breakthrough, but they were hardly surprising. In fact, it would be unusual if all the carbon that humans are pumping out didn't cause more heat waves, said Ted Shepherd, a climate scientist at the University of Reading in England. "It would be almost incredible, it'd take something very unusual not to have an increase in warm extremes," he said. For other types of extremes, attribution gets complicated quickly. To understand why, consider how these studies are done. In the 1990s, University of California, Berkeley, scientists began listening for messages from extraterrestrials in radio signals captured from space. As expected, searching for E.T. was computing-heavy. Instead of building a supercomputer, the scientists built a virtual network called "stay@home" that uses the idle computing power of internet-connected desktops around the world. The only thing needed to run it is people with a modicum of nerdiness who compete with each other to analyze the most signals and track their contributions on leaderboards. "We just asked the people who were doing stay@home, are you also interested with researching extreme weather and climate events?" said Friederike Otto, an Oxford physicist who helms the weather attribution initiative with Allen. The experiments run on 70,000 computers. Their setup resembles clinical trials, such as one where doctors test a drug by comparing lab rats that get the drug with those that don't. For the planet, the drug is carbon dioxide. Scientists want to know if it changes the occurrence of extreme weather events. They would of course need two sets of planets -- one that's exposed to humans and one that's not -- to conduct a real study. Instead, they turn to computers. Climate models are virtual representations of Earth split into grids. Each cell contains algorithms that reflect the interactions among the ocean, clouds, water vapor, aerosols, trees, soil and other tiny widgets. Scientists can input observations taken from the real world into the model, which crunches forward in time and spits out a climate forecast for decades hence. As one might surmise, representing how a tree interacts with a cloud (and they do interact) in algorithms is challenging. There are about 30 climate models available today, and each has slightly different physics, which means their forecasts do not always match. Scientists do not rely on any one model and instead consider results from a bunch of models, which make up an ensemble, in the same sense that a bunch of cows make up a herd. The ensembles are remarkably consistent in their projections of temperature. They are less consistent at projecting dynamic weather, such as thunderstorms. The Oxford group runs its climate models thousands of times. Some runs resemble our present-day planet; others are closer to the Earth of the 18th century. Worlds of extremes unfold, governed by the chaos of the climate system. In some worlds, a heat wave will scorch Europe. In others, the continent basks in a pleasant summer. Otto and her colleagues count how often the weather event of interest occurs in a warmed world compared with 18th-century Earth. Statistics reveal whether humans played a role and how frequently the event could recur. "We've demonstrated that it is doable with easy-ish events," Otto said. This approach works less well for complex weather, according to some scientists. After the Colorado floods in 2013, Martin Hoerling, an atmospheric scientist at the National Oceanic and Atmospheric Administration's Earth System Research Laboratory in Boulder, and his colleagues found that climate change has decreased the likelihood and strength of heavy rainfall in northern Colorado. The findings made news: "2013's flood-triggering rains not caused by climate change," proclaimed Boulder's Daily Camera. National Center for Atmospheric Research scientist Kevin Trenberth. Photo courtesy of the National Center for Atmospheric Research. The headlines provoked Kevin Trenberth, an atmospheric scientist at the National Center for Atmospheric Research, who, like Hoerling, is stationed in Colorado. But they're miles apart on how much to blame humans for extreme weather. Trenberth believes many attribution studies tend to underestimate people's impact on the climate. To him, almost every event is influenced by our emissions. Trenberth says, and some scientists agree, that attribution studies that use climate models do not work well for weather events that are local and dynamic -- a flash in the pan. These include wildfires, hurricanes, hail and thunderstorms. In some cases, they include droughts and heavy rainfall. When models do not find a fingerprint of human-caused climate change for a particular event, this does not mean that humans are off the hook, Trenberth said. "The issue always is, how good is the model, how realistic is the model compared with the real world?" he said. "With some of the work that is being done in the U.S., especially with regard to NOAA, a lot of the stuff which is being done is too heavily oriented toward the model, and the model isn't good enough. As a result, the statements are not reliable for the real world." Attribution scientists are aware of the limitations, of course. They choose their models carefully, layer different approaches and stress the limits of their knowledge. They often emphasize caveats with statements like, "It is a single model, or a single methodology." But sometimes, they don't. The general public probably does not understand the nuance, acknowledged Stephanie Herring, an attribution scientist at NOAA's National Centers for Environmental Information. "To come out and say, as Hoerling et al. did, that they could not find a role for climate change in the Colorado flood, I think, too often gets interpreted as, there was no influence of climate change in the Colorado flood," she said. There is hope that attribution of hurricanes and other dynamic weather events will improve as scientists tinker on climate models, said Adam Sobel, a climate scientist at Columbia University. "The models get better pretty fast, the computers get better pretty fast," he said. "It does not only depend on that, but that is one factor that could change things more quickly." Attribution: proving climate change or disproving it? 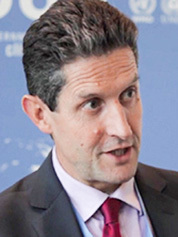 Trenberth published his concerns in Nature last year. He wrote that scientists should not ask whether human actions have changed the likelihood of a particular storm happening in the future. He suggested that scientists should instead study how the features of a particular storm, such as the amount of rain it dumps, was affected by global warming, he said. "Given that we've got a storm, what was the impacts of humans on the resulting temperature and the precipitation?" Trenberth said in an interview. For instance, in the case of Superstorm Sandy, which hit the Northeast coast in 2012, Gary Lackmann, a scientist at North Carolina State University, analyzed the question: Given the storm happened, did climate change make it worse? He found that global warming may have modestly affected the storm track and intensity of Sandy. Visualization of a climate model running on the weather@home virtual network shows global temperatures rising over time. 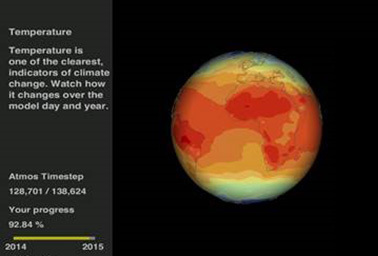 Graphic courtesy of climateprediction.net. Most attribution scientists have resisted Trenberth's approach. It is based on simple rules of thumb that guarantee a role for man-made global warming in the extreme event, said Dáithí Stone, an attribution scientist at the Lawrence Berkeley National Laboratory. Sometimes, humans simply do not play a role in extreme weather, he said. "It is quite plausible that we have not affected any characteristics of the storms on the Eastern Seaboard of the U.S.," he said. "That is a possible result of the analysis -- and I think it is important to recognize that that is a result." Another drawback is that Trenberth's approach gives qualitative results, which are not very useful for policymaking, said Herring at NOAA. "To simply tell a water resource manager that, 'Oh, yeah, climate change is making heavy precipitation events more likely,' is not particularly helpful information," she said. "Does that really change our decisionmaking?" Hoerling thinks the controversy about attribution is myopic. Climate scientists study extremes in order to better understand the climate system, with the ultimate goal of generating more accurate weather forecasts, he said. The best way to do that, he thinks, is to use traditional approaches. "The various factors that cause an extreme [event] are part of our ongoing studies of weather -- what causes weather to be extreme," he said. "Has there been a new factor that materially changes how weather extremes happen? For heat waves, yes. For other events, I think that's one of the challenges the science has moving forward." Shepherd of the University of Reading, who has collaborated with Trenberth, said that both approaches -- traditional attribution and Trenberth's -- could be used in different contexts. Traditional attribution could be useful for analyzing heat waves, cold spells, droughts and heavy rainfall. The Trenberth approach could be used for hurricanes, wildfires, thunderstorms and such events, he said. "I'd advocate that people try both and see which is more informative and find ways to combine them somehow," he said.